The story of Plotinus was for me a genuine surprise. As the leading philosopher of the Neo-Platonists, the wisdom of this man from almost 1,800 years ago is amazing. 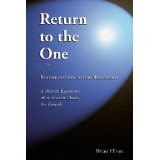 While his philosophy, as captured in the Enneads, requires a patient and ardent earnestness to penetrate, I found relief in Brian Hines “Return to the One”. Check it out; I think you will like it!